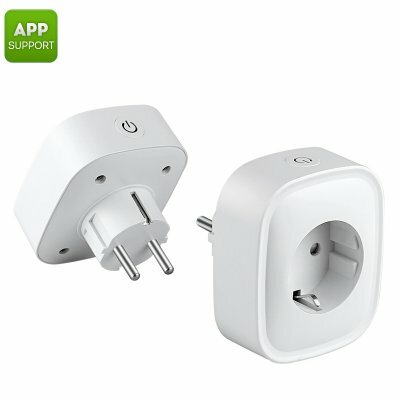 Successfully Added Smart Home WiFi Plug - Type F, Wi-Fi, iOS + Android App Support to your Shopping Cart. This pack of two smart WiFi plugs means you can manage and control your electronics remotely from your smartphone, So you'll never have to worry about leaving the TV on or checking if you turned the aircon off when you left home. The Type-F sockets can be plugged into your wall socket or adapter and let you control the power of any gadget running through them. This pack of two sockets is a superb way to set up lighting and other household appliances when you're away on holiday to give the impression that there is someone in. Simply connect the phones to your Wi-Fi network and install the smart app on your phone and you can start remotely managing your gadgets and gizmos from anywhere you desire.